"2002 was a great year for calendars." 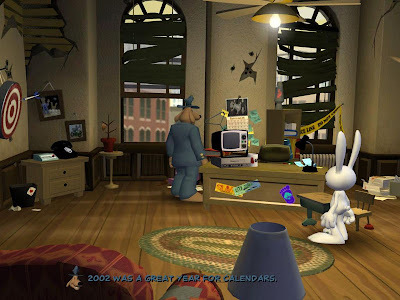 The calendar in Sam & Max's office has a dead possum with a tire track on it's back. It strongly resembles the Possum kids from Bone. The fact that the office calendar is stuck at 2002 might be a reference to Sam & Max: Freelance Police, which was announced by LucasArts in 2002, then was canceled in 2004.